This work was supported in part by: NSF CAREER (CHE-0952768), NSF REU (CHE-0243828 & CHE-0851194), NSF STEM-ENGINES URC (CHE-0629174), a Henry Dreyfus Teacher-Scholar Program award to J.G.G., an HHMI Scholar award to C.L.B. and J.G.G. by a grant to Hope College by the Howard Hughes Medical Institute through the Undergraduate Science Education Program, and the Hope College Chemistry Department’s Schaap Research Fellows program and Undergraduate Research Fund. The MU3C  cluster was supported by NSF MRI (CHE-0520704 & CHE-1039925). 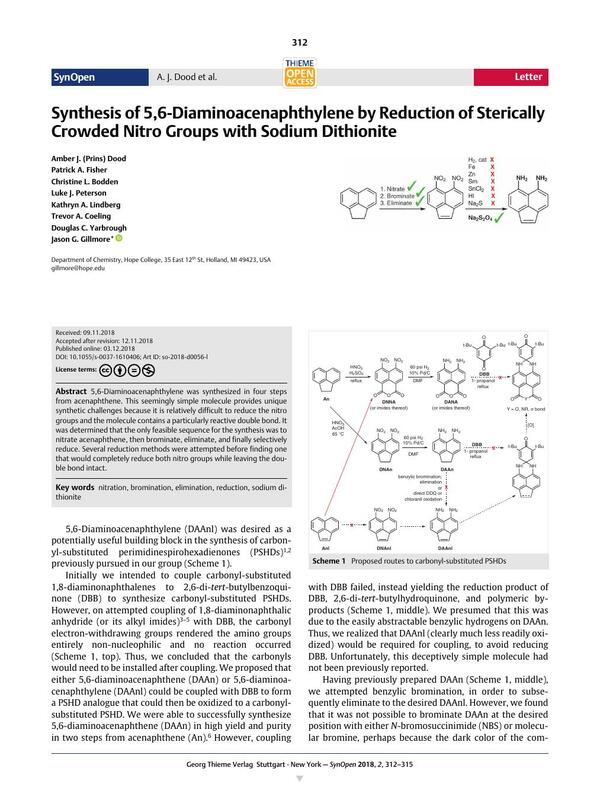 5,6-Diaminoacenaphthylene was synthesized in four steps from acenaphthene. This seemingly simple molecule provides unique synthetic challenges because it is relatively difficult to reduce the nitro groups and the molecule contains a particularly reactive double bond. It was determined that the only feasible sequence for the synthesis was to nitrate acenaphthene, then brominate, eliminate, and finally selectively reduce. Several reduction methods were attempted before finding one that would completely reduce both nitro groups while leaving the double bond intact. 1H NMR and GC/MS data for the four-step synthesis of the title compound, and raw output files for the molecular orbital calculations in Figure 1 are provided. Supporting information for this article is available online at https://doi.org/10.1055/s-0037-1610406. 7 5,6-Dinitroacenaphthene (DNAn) (ref. 3): Acenaphthene (39.9 g, 259 mmol) was dissolved in glacial acetic acid (500 mL). Fuming nitric acid (100 mL) was added dropwise via addition funnel while the flask was submerged in an ice bath. After the addition was complete, the flask was removed from the ice bath and placed in an oil bath set to 65 °C. The reaction was stirred with heating for 6 hours and then allowed to cool to room temperature. The precipitated solid was collected on a medium frit and washed with water (4 × 50 mL), then dried under vacuum overnight. Yield: 27.3 g (43 %); yellow solid. 1H NMR (400 MHz, CDCl3): δ = 8.29 (d, 2 H), 7.51 (d, 2 H), 3.58 (s, 4 H). GC/MS: m/z = 244 (parent ion), 139 (base peak). 8 1-Bromo-5,6-dinitroacenaphthene (BrDNAn) (ref. 9): DNAn (11.58 g, 47.4 mmol) was dissolved in benzene (1000 mL) and stirred. Br2 (7.5 g, 47 mmol) in benzene (100 mL) was added dropwise to the flask with vigorous stirring. Throughout the addition and subsequent reaction, four 200 W incandescent lightbulbs were used to irradiate the reaction flask. Irradiation provided substantial heating, but a heating mantle was used to assure reflux was maintained for seven hours after addition was complete. The reaction was allowed to cool to room temperature and then transferred to a separatory funnel and washed with water (500 mL). The organic layer was dried over calcium chloride and gravity filtered. Solvent was removed by rotary evaporation. Yield: 9.78 g (64 %); pale-brown solid. 1H NMR (400 MHz, CDCl3): δ = 8.37 (d, 1 H), 8.35 (d, 1 H), 7.76 (d, 1 H), 7.57 (d, 1 H), 5.89 (d, 1 H), 4.29 (dd, 1 H), 3.93 (d, 1 H). GC/MS showed dehydrohalogenation in the injector port, giving the identical pattern and same retention time as observed for DNAnl (ref. 10): MS: m/z = 242 (parent ion), 138 (base peak). 10 5,6-Dinitroacenaphthylene (DNAnl) (ref. 9): BrDNAn (13.7 g, 42.4 mmol) was dissolved in toluene (100 mL) and pyridine (100 mL). The solution was heated to reflux for three hours, with stirring. The reaction was allowed to cool to room temperature, and solvents were removed by rotary evaporation. The resulting solids were stirred in chloroform (70 mL) for 10 minutes, then vacuum filtered through a medium frit. This chloroform extraction of the solids was repeated four more times. The combined chloroform extracts were washed with HCl (ca. 300 mL) and then brine (ca. 350 mL). The organic layer was dried over sodium sulfate and then gravity filtered. Rotary evaporation of the chloroform extracts yielded a brown solid (4.11 g, 40%). 1H NMR (400 MHz, CDCl3): δ = 8.15 (d, 2 H), 7.67 (d, 2 H), 7.12 (s, 2 H); 1H NMR (400 MHz DMSO-d 6): δ = 8.39 (d, 2 H), 7.99 (d, 2 H), 7.35 (s, 2 H). GC/MS: m/z = 242 (parent ion), 138 (base peak); an identical pattern at the same retention time as was observed for BrDNAnl (ref. 8). 21 Computations were performed with the Midwest Undergraduate Computational Chemistry Consortium Cluster housed at Hope College (ref. 22), using density functional theory with the B3LYP hybrid functional (ref. 23) and 6-311+G(2d,p) basis set in vacuo implemented using Gaussian (ref. 24) accessed via the WebMO (ref. 25) web-based graphical user interface. 27 5,6-Diaminoacenaphthylene (DAAnl): DNAnl (0.50 g, 2.06 mmol) was dissolved in acetonitrile (300 mL). Sodium dithionite (2.14 g, 12.3 mmol) and sodium bicarbonate (2.09 g, 24.9 mmol) were added to the solution and dissolved with the addition of water (200 mL). The mixture was allowed to stir gently under nitrogen at room temperature for 40 hours. The reaction mixture was diluted with water (1300 mL) and extracted with ethyl acetate (5 × 200 mL). The organic extracts were dried with anhydrous potassium carbonate, filtered, and rotary evaporated to yield a brown solid (68.6 mg, 18%). 1H NMR (400 MHz, DMSO-d 6): δ = 7.43 (d, 2 H), 6.70 (s, 2 H), 6.64 (d, 2 H), 5.87 (broad s, 4 H); GC/MS: m/z = 182 (parent ion, base peak). HRMS: m/z calcd for C12H10N2: 182.0844; found: 182.0846 (error <1.1 ppm).